This Cream of Broccoli Soup Recipe is perfect for busy winter days! Super creamy without cream. I use milk instead. This is such a heart-warming and tasty soup. Ready in less than 30 minutes. You will be amazed when you see how easy it is to make this cream of broccoli soup recipe. For one thing, everything goes into the same pot and then pureed with a hand blender. I love it when I don’t need to use several dishes and cups to make just one recipe. You need a small saucepan though to prepare a simple chili powder sauce to top the soup when serving. Second, it is on your table in less than 30 minutes. Unlike our Cream Of Broccoli Cheese Soup, this recipe calls for a little flour and milk. 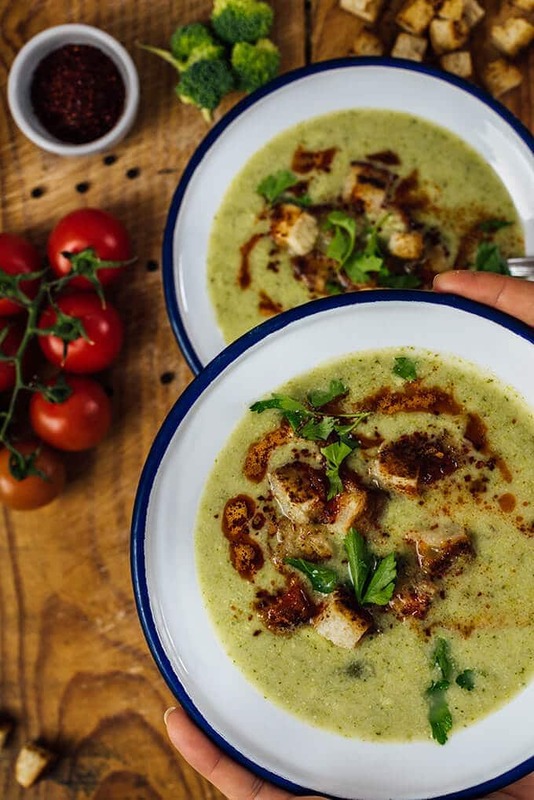 If you are looking for a milk-free and gluten-free broccoli soup, go check it out! First, cook a little flour with butter. Second, pour cold milk carefully and whisk it non stop to have a smooth mixture. Cook until it thickens. Third, add in green onion and garlic. Cook for a few minutes. Finally, add in hot water and broccoli. Cook until tender, remove from heat and puree. 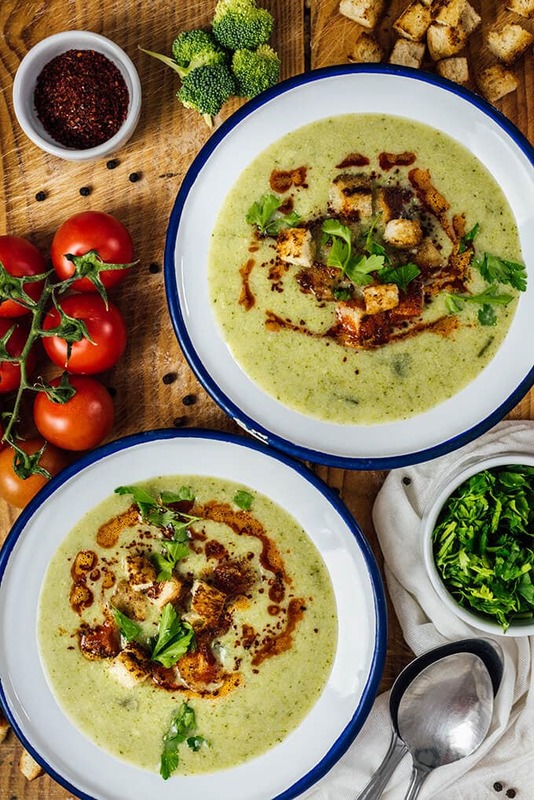 Also, this cream of broccoli soup recipe is healthier and lighter than most of other broccoli soup recipes around the Internet. I don’t use heavy cream. It gets its creaminess from milk. There is always a dilemma in the house whenever I make this soup: Making it chunky or pureed. I love to see the broccoli florets in the simmering milky mixture. The contrast colors in the pot are so beautiful that makes me want to leave the soup as it is. On the other hand, my family loves it as smooth as possible, so I blend it in the end. I think this soup doesn’t need any additional flavors at all, so I don’t use chicken stock, which is like a must for soups. Just water and milk work really well in this soup. The best topping for this cream of broccoli soup is a super simple chili powder sauce. Melt butter in a small saucepan over medium heat, add in chili powder, cook for about 10 seconds, stirring continually and remove from heat. You can use this sauce in any soup you like. It makes a perfect final touch on soups. Besides the sauce, I love to garnish the soup with buttered croutons and herbs. The result is a healthy cream of broccoli soup with a nice color that perfectly balances refreshing and earthy flavors. 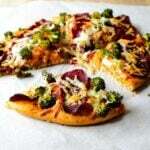 Are you a fan of broccoli and want more recipes with it? Please don’t forget to rate the recipe and leave a comment below when you make this soup. Your thoughts are so valuable to me. This is a velvety and thick broccoli soup without cream that you can proudly serve as a starter at any dinner party. In a medium pot, melt butter. Add in flour and cook until it gets slightly brown, stirring continually. Pour in milk and stir continually using a hand whisk so that you have a smooth mixture. Cook for 3-4 minutes or until slightly thickens. Add in chopped green onion and garlic, cook for 2-3 minutes. Pour in hot water and add in broccoli florets. Season with salt. Cook for about 10 minutes or until broccoli florets are tender. Don’t overcook though so that they don’t lose their color. Remove from heat and puree using a hand blender. Fort he sauce, melt butter in a small sauce pan, add in chili powder and cook for about 10 seconds or until chili powder gives its nice red color to the melted butter. Remove from heat. 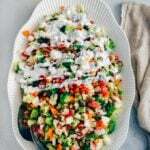 When serving, share the soup into bowls, drizzle chili powder sauce on each and top with croutons and chopped parsley. This post was originally published in 2017 and has been updated with additional information. I made it yesterday and everyone including the little on in the family gobbled it up! Love the simple sauce on it! Thanks! I love broccoli soup and it is actually at the moment the single way I can get my kids into eating broccoli. I would love to try your version, I have never used flour to thicken it. It’s a great way to hide veggies in soups for kids, isn’t it? Hope your kids love my version too. And I think I will love broccoli after trying this recipe! Madalina, thank you for stopping by. We don’t have vegetable stock in Turkey. Is it something healthy? I hope your sweet daughter will like this soup. Yesterday my 5-year-old nephew tasted it and ate it all without complaining. Thanks for your nice words. My daughter just recently started to like broccoli and she loves blended soups. I haven’t thought of making broccoli soup and what a great idea! My family would love it. Great recipe!